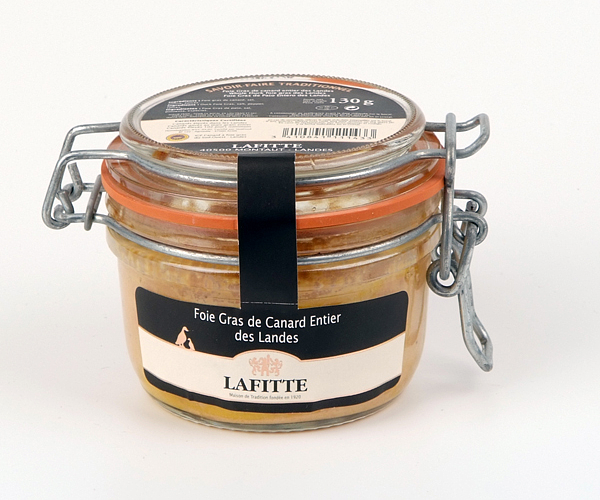 Whole Duck Foie Gras de Landes in jar. Made from whole Foie Gras and one or several full liver lobes with seasoning. Authorized seasoning include salt, sugar, spices and aromatic herbs, eau-de-vie, wine liqueur and wine. Keeps for 4 months in cool, dry storage. When cut, the Whole Duck Foie Gras is of harmonious texture. It has a strong aromatic flavor. Served slightly chilled, specially enjoyable with sweet wines of the region, Montbazillac or Sauternes. We regret that this product cannot be shipped outside France.